The Guardhouse is an elegant building that during the 19th century hosted the troops that had the task of patrolling the city, and it was erected on the same spot of the old Spanish guardhouse. The three-storey building was meant to decorate the square and played an official role in such a crucial corner of the city. Construction works started in 1835. The frieze that decorates the facade depict the peace treaty between the Guelphs and the Ghibellines that was signed in Novara on the 20th December 1310. At the heart of the composition is Emperor Henry VII, who acted as a mediator between the two parties. 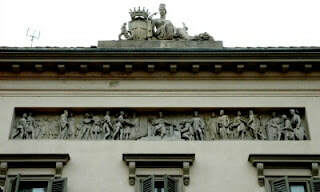 The upper portion of the building is crowned by a female statue personifying Novara; in her left hand she is holding a cornucopia; her right arm is leaning on the city’s coat of arms. QUESTION 12 - Observe the frieze. Can you recognize the emperor? Which elements indicate his importance and status? QUESTION 13 - ​Which decorative elements point at the military function of the building (military theme)? 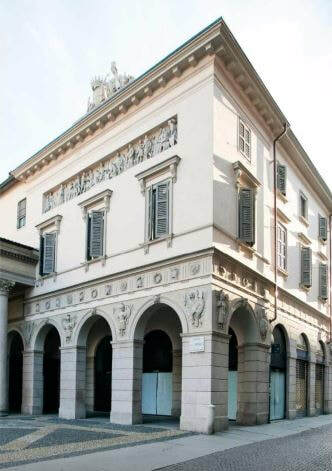 QUESTION 14 - Which element is a clear reference to the city of Novara? Do not forget to look for the cache! Well done, now go to http://geocachingraviteam.weebly.com/neoclassicim---test.html and upload your replies (you can do it right now or go back to it once you are at home). If your answers are correct you can take a screenshot of the final page and bring it to your teacher. In order to prove you have done the trail yourself, bring also a photo of you in front of each point of interest J. If you are not a students and you would like to play for fun, you are very much welcomed to do it. Thank you for playing, see you next time !